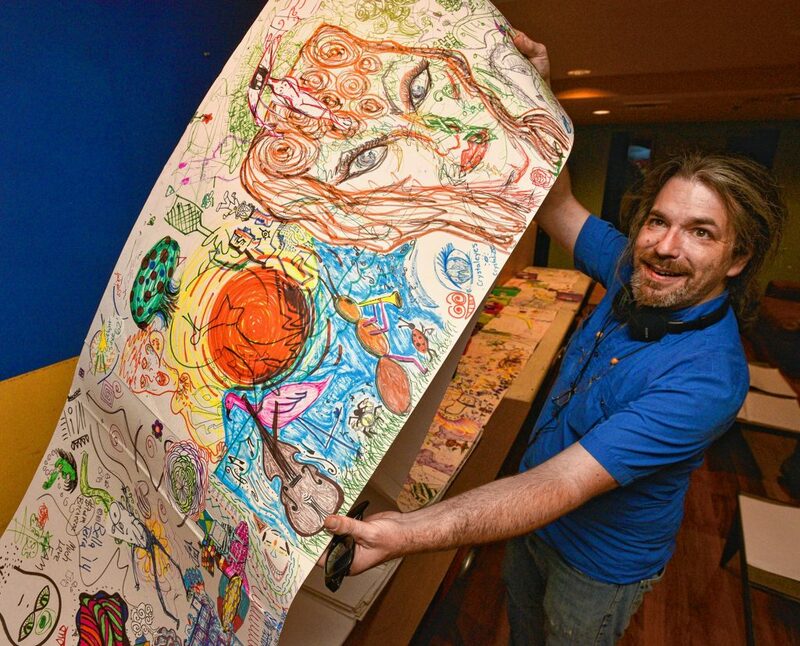 Every Tuesday during open mic night at Bishop’s Lounge in Northampton, Longmeadow artist Max Rudolph rolls out dozens of pages of artwork—each spanning more than 10 feet long—across the tables in back and asks people to pick up a crayon or marker and draw whatever comes to mind. For more than a year, Rudolph, 49, has been working on a collaborative art project in the form of a giant coloring book, which weighs more than 60 pounds and contains hundreds of pages filled with cartoon sketches, graffiti-inspired art, zany animal drawings, political commentary, stylized whimsical artwork and doodles. Rudolph, who is a graduate of Greenfield Community College and the School of the Museum of Fine Arts at Tufts in Boston, says he started the project as a way to introduce art as a form of entertainment accessible to all. “My concept was, ‘Let’s make art happen. Let’s find out what makes Western Mass unique or what is their aesthetic? If they have folk art, what would that be?’ I’ve met so many artists [through the project] and it’s all kinds of fun,” Rudolph said. He said he thinks people tend to be alienated by fine arts, but hopes his project brings a more down to earth approach to visual art. The idea behind the coloring book project started after Rudolph and some of his artist friends received hundreds of pages of 37-inch long by 23-inch long white paper from one of his friend’s parents, which he stores in his basement. Rudolph says he’s found that people are more open to creating art when they’re asked to color or draw as opposed to making art, which can be intimidating. During the past year he’s taken portions of the coloring book to different locations up and down the Pioneer Valley, including Make It Springfield, a community center in Springfield, Gateway City Arts in Holyoke, Anchor House of Artists in Northampton, and Hawks & Reed Performing Arts Center in Greenfield. He typically brings his project out into the Pioneer Valley once a week. Certain aesthetics emerge based on where he brings the project, he says. For instance, in Northampton he sees a lot of imagery relating to hippie culture, such as Grateful Dead lyrics. In Springfield, he says, graffiti designs are more common. No matter where he sets up his coloring book, there’s one constant theme that recurs in sketches, drawings, and doodles: local music. He said his dream is to have the coloring book project on display at the Massachusetts Museum of Contemporary Art (MASS MoCA) in North Adams. He thinks his project has artistic merit in the vein of Andy Warhol’s “The Factory,” a studio in New York during the 1960s where artists, musicians and filmmakers collaborated to create radical art. “I’ve kind of decided that the road to this is art as entertainment as opposed to art as a stagnant installation,” Rudolph said. Rudolph, who also creates collages, has found that challenge is using copyrighted images in his work. But with the coloring book project, he says he’s gained a sense of freedom by using some of the pages of the book for his collages. In the meantime, Rudolph works for the most part as a full-time artist, but does odd jobs such as landscape work for his neighbors and moonlights as an I-Ching inspired fortune teller at Groundlings in Florence. On a hot and humid summer night on August 14, Rudolph set up his coloring book while open mic performers took to the stage. Having the book in the back gave attendees another medium for artistic expression. The open mic host for the night was Lauryn Winiarski, a member of Rice: An American Band, who was filling in for regular host Tobey LaRoche, of local afrobeat group Shokazoba. Now, the coloring book project is 22 inches wide and 250 feet long, Rudolph said. He uses a gluestick to bind the loosely collected pages of the book together. At least 100 additional feet of coloring book pages were cut from the project after the book proved too heavy and unwieldy for transport. He keeps most of the materials in his car for convenience. At the bar, Joe Kapinos, a 27-year-old Chicopee resident, was drawing on a white piece of paper that Rudolph had handed him. He said he was initially surprised, but found the idea of drawing interesting. “Being 27, I can’t tell you the last time somebody handed me paper and some pencils and told me to just draw something,” Kapinos said.